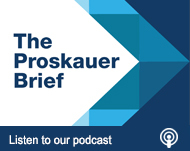 In this episode of The Proskauer Brief, senior counsel Harris Mufson and associate Laura Fant discuss the New York City Temporary Schedule Change Law that recently went to effect. This law effectively requires employers to grant employee requests for temporary schedule changes for certain medical and family care purposes, which can include caring for a minor child or for another family or household member who requires care due to a disability or medical condition, attending certain government proceedings for benefits and also for other reasons under the New York City Earned Sick and Safe Time Act. Harris Mufson: Hello welcome to the Proskauer Brief Hot Topics on Labor & Employment Law. I’m Harris Mufson and on today’s episode I’m joined by Laura Fant and we’re going to discuss the New York City Temporary Schedule Change Law. So Laura, a number of new employment laws have been passed in New York. One that recently went into effect is the New York City Temporary Schedule Change Law. Can you describe briefly what that law is? Harris Mufson: So what is a temporary schedule change? Laura Fant: So as defined under the law a temporary schedule change is a limited alteration in the hours, times or locations where an employee is expected to work. So such changes can include things as using paid time off perhaps in a way that the employers general policy doesn’t necessary contemplate: working remotely, telecommunicating, swapping, shifting work hours or using short term unpaid leave. Harris Mufson: And how many temporary schedule changes are employers required to give employees in New York City? So the law requires to grant requests at a minimum of either twice per calendar year, for up to one business day for each request or once per calendar year if the request is for two business days. The employer can of course be more generous and grant more if they wish but that’s the minimum that the law requires. Harris Mufson: Does the law exempt any employees from the requirement requiring temporary schedule changes? Laura Fant: So, the coverage of the law is pretty broad but there are a few narrow exceptions. So, employees don’t become eligible to request these schedule changes until after they have worked for the employer in question for at least one hundred and twenty days and they also have to work at least eighty hours per calendar year in New York City. In addition there are certain larger classes of employees that are exempted. The first of which is employees who are covered by a collective bargaining agreement that both waives the provisions of the bill and also addresses temporary schedule changes and in addition there are certain employees who work in the motion picture, television and live entertainment industry that are exempted as well. Harris Mufson: Can employers require employees to exhaust paid leave before granting requests for temporary schedule changes? Laura Fant: So this law has a certain amount of interplay with the New York City Earned Sick and Safe Time Act often referred to as ESSTA. The Temporary Schedule Change law is very clear that employees are not required to exhaust any paid leave that they have available to them under ESSTA before they make a request for a temporary schedule change under this law and in addition leave that is granted under ESSTA does not count towards a request under this policy. So effectively these two schedule change requests are in addition to any leave available under ESSTA. Harris Mufson: So let’s just say an employee says to an employer “Look, I need to change my schedule because I have to pick up my son or daughter one day from school and I want a temporary schedule change and I want to work from home for that one day.” What is an employer supposed to do in that circumstance? Laura Fant: So under the law the employer has two options in that circumstance. They can first consider the request as made by the employee so the request was to work from home that day. They can take into account what are the duties of the job? Will this job really work as a work from home option and if so they can grant the request as made by the employee. Alternatively if they feel that the request as made will just simply not work for business reasons, they have the option to always grant a request as unpaid leave. So there’s kind of two those two options: Grant it in the manner that it’s requested or grant it as a period of unpaid leave. Harris Mufson: And are there any notification requirements that employers are required to adhere to in terms of notifying employees about the law? Laura Fant: Yes. So the Department of Consumer Affairs is the City agency that’s tasked with enforcing this law and they have just announced a mandatory posting requirement. So a copy of the poster is available on the DCA’s website. It should be added to New York City employers’ giant wall of posters that I’m sure they already are maintaining. The law does not include a separate written notice requirement so it is not mandatory for employers to include a written policy about this law in their handbooks. However, we’ve been seeing many employers choosing to include a policy just so it’s clear to their employees what their rights are under the law and how the temporary schedule change mechanism works. Harris Mufson: Thank you for joining on the Proskauer Brief today. Stay tuned for more insights on the latest hot topics in Labor & Employer law and be sure to follow us on iTunes.